One of the main things any aspiring business website owner thinks about is how the site will look. Doubtlessly, you should offer high quality content that can keep your audience engaged. And also equally important is the platform on which you will offer this content. The website should look clean, functional and organized. And for this you should have a premium theme. If you are having no knowledge in site administration, WordPress is the best platform for you. Not only it is useful when you are not experienced in site administration, but also saves time, is highly organized and dependable. WordPress has countless premium themes with which you can make your site look extremely attractive, functional and user-friendly. Here are top 5 themes. Cusotmizr is an extremely easy to customize and versatile WordPress theme, that gives a professional look to your website instantly. It has been designed mainly for visitor engagement and so, allows anyone to form a fast, beautiful and mobile friendly website that can go with all devices and browsers. 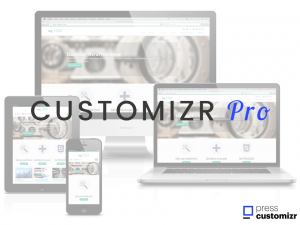 Customizr works with all major WordPress plugins like JetPack, bbPress, WooCommerce and many others. Having a very active community of developers and users and rated by hundreds Customizr theme is a secure and reliable design choice to publish your content. Get fantastic savings too with Press customizer promo codes! This is an extremely dynamic, visually striking, technologically modern, attractive, interactive and appealing WordPress responsive multipurpose, multilayout theme, designed to be eloquent, creative and expressive one-stop solution for a huge array of website applications. You can generate professional-looking static layouts using Oshine’s dozens of amazing preincluded demos, high resolution vistas in the background, seamlessly compose expansive Parallax static, or you can even entice your users with locally or remotely hosted Parallax static video backgrounds. Another WordPress theme which is extremely attractive and super engaging is Uncode. Being visually colorful and vibrant, cleanly designed, efficiently coded, fast loading and technologically advanced and responsive, Uncode is highly successful. It has an amazing collection of features and tools that churns out professional and highly interactive pages and website without having to write even a single line of code! Considered as one of the best WordPress themes, Kalium is perfectly suitable to blogs and portfolios. It’s amazing for both potential employers as well as customers because they navigate your streamlined, well-designed pages. While your website will be judged by its quality, Kalium guarantees that each first impression about the website will be positive. You can learn more about this theme with the theme documentation. Trusted by hundreds of thousands users, the plugins and themes of Themeisle make your website look stunning. Their themes have been a mainstay among the most popular WordPress themes. They build each theme with the end user in mind. Therefore their support is very strong. They have world-class designers as their partners and the themes can be installed and updated within a moment. You can now save on Themeisle themes with Themeisle coupons. So, while considering which theme to use for your WordPress site, consider one of the above and get the real satisfaction of having a beautiful and functional site.